“You da man!” shouted YouTube celebrity Mystic7, giving a rather biased shout out to Niantic CEO John Hanke. This is the same Niantic who’s sponsored Mystic7 and organised the disaster that was Pokemon GO Fest. It’s the same John Hanke who was practically booed off stage by an angry mob at the event. Still, at least the crowd didn’t throw a bottle at him. Instead, they did throw a bottle at the host for the event, Rachel Quirico. Don’t worry, she’s okay. It missed her, and she carried on with her presentation with the sort of determined, optimistic and fake enthusiasm that the band on the Titanic had as the ship went down. For all her clueless energy, the only things which excited the crowd were the news of a full refund, some virtual cash in their Pokemon GO accounts and the gift of a free Legendary Pokemon. You know, those things people are supposed to catch, not be given. It’s a cheat. But like watching a train wreck, I just couldn’t stop myself from viewing it all with a kind of morbid fascination. Also, I like Pokemon GO. So let’s back this up a bit and explain what was supposed to happen at this event. Basically, the trailer sums it up. A bunch of people gather together, fight a Legendary Pokemon as a common goal, and then cheer in unison as they get the Pokemon they’ve earned. The video is uplifting and inspirational and gives fans a feel-good moment. In real life, 20 000 of those fans gathered in Chicago’s Grant Park hoping to experience it for real. Unfortunately, the real world doesn’t work like that. Between people waiting in line for three hours and server problems which crashed the game, it was a frustrating experience for those players. Technical glitches plagued the day’s event, with many being unable to log in to the game while others faced a lag so bad that it was unplayable. People watching at home could experience this PR disaster for themselves, thanks to a live streaming video of the event. Well, they could once it started. It was delayed by an hour. Yes, that’s how badly things went wrong. After showing the misery the glitching game was inflicting on the players, those behind the live streaming decided to air some cringe-worthy interviews with “team ambassadors”. The crowd booing during a Mystic7 interview where the event was described as “a great success” kind of tells you it wasn’t. An unwelcome highlight was up next: live gameplay footage, which should have been good, except the player had given his Pokemon R-rated names. Cut to a still graphic of Pokemon GO, presumably their equivalent of a “please stand by, we’re experiencing technical difficulties” sign. With things falling apart, the live feed then aired an instructional video of how to beat raid bosses. Then, with nothing else to show, they aired it again. And again. And again. And again. Occasionally they cut back to the live event for an update which was always bad but, by that stage, they’d stopped showing the now-hostile crowd of fans – or much of anything else, for that matter. Well, except for that “please stand by” graphic, which they then returned to. They kept that on for a what seemed like another few hours. Finally, mercifully, they just pulled the plug and brought the pain to an end. See, around the world diligent pokemon trainers had worked furiously to do their fair share for those in Chicago by catching pokemon. 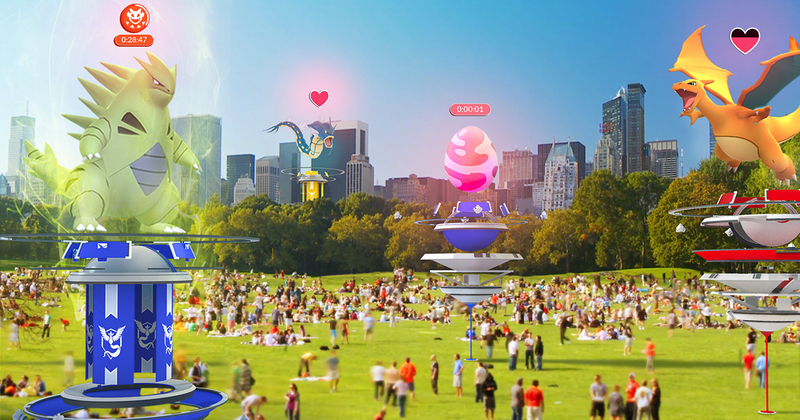 The release of the Legendary pokemon was supposedly based on results happening in Chicago, as well as players in the outside world, who were given a time limit window to join in. The failure of the Chicago event meant that they’d botched their side of this partnership, making the world results side of things pointless. The rest of the world was also ignored, with no information or updates being sent out to the global players. I should know, I was one of them. When catch statistics shown at the event jumped wildly back and forth, people began to question whether that the whole event was rigged anyway. Pokemon GO Hub confirmed that Niantic was manually lowering the challenge limits to ensure success. At the end of it all, players at the event were given some freebies for their troubles, and Niantic offered a weak apology. It was a disaster. As a Pokemon GO player, I was one of those out in the world doing my part to ensure success. Like Niantic and all the other fans, I’d hoped the event would be a success. The logical side of my brain knew that they’d be rolling out the Legendaries anyway. After all, nobody holds an international PR event and then doesn’t unveil the product they’ve been hyping… especially if they’d have to publicly say that the reason they couldn’t unveil it was because the players had screwed up and failed. It was inevitable that Legendaries would happen. People play games as a means of escape. That video was a piece of marketing hokum, sure, playing on the emotions of the fans. But damn it was good. The total failure of the event ripped the player’s hopes and dreams to shreds though, exposing their escape in to the game as a fraud. I wanted to hate the game afterwards. I wanted to hate Niantic for making me falsely believe I was a part if something bigger, something special. It was all a lie. A big, fat, beautiful lie. And like many fans I had bought in to it. You can always trust reality to crash in and screw things up.